This is a superb versatile recorder that can be used as either a dedicated mobile phone call recorder or as a stand-alone room recorder with a super-sharp sensitive microphone. No other recorder can offer both facilities in one sleek and compact unit. The Bluetooth Call Recorder is a superb versatile recorder that can be used as either a dedicated mobile phone call recorder or a standalone room recorder with a super-sharp sensitive microphone. No other recorder can cover both requirements in one compact unit. The problem experienced by most when attempting to record their own mobile phone conversations is that the recorder incorporated in the Smartphone system will always signify recording by emitting a background ‘beeping’ noise, alerting the other party on the call that the call is being recorded at that time. There are other methods, most of which are more cumbersome, that allow discreet call recording, but now the Bluetooth Call Recorder provides a simple and effective solution to this problem. All modern mobile phones including the iPhone, Android handsets, Windows Mobile and BlackBerry have a bluetooth transmitting facility that is used for transferring files or for connecting to headsets and car stereos enabling a hands-free calling capability. The Bluetooth Call Recorder also has its own bluetooth facility enabling it to be paired with mobile phones for use as a lightweight headset. The device has a recording facility built in and as such can capture both sides of the call conversation on its internal memory storage. The recorder is silent in operation and does not emit any background noise during the call. 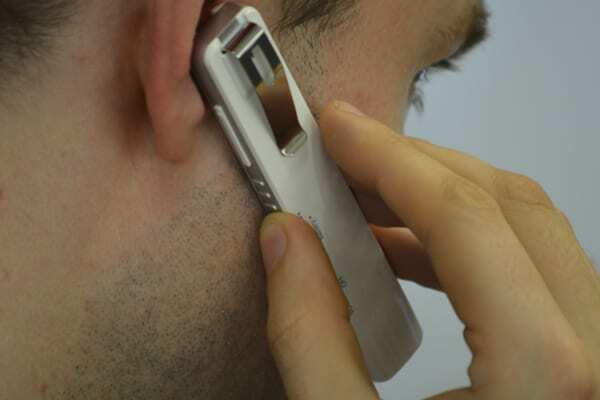 Calls are conducted through the Bluetooth call recorder itself, which means that the mobile phone that it is linked with for recording the call can be kept in a pocket during the process. 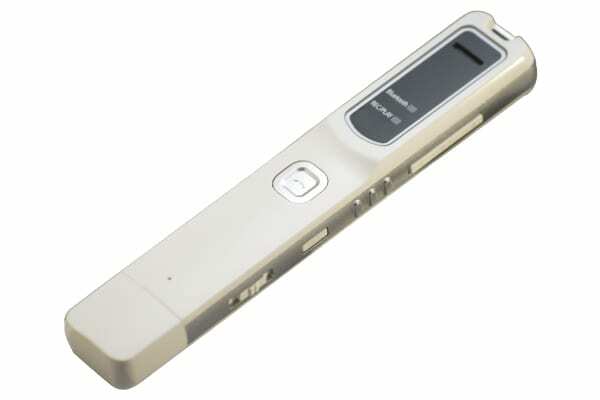 The Bluetooth Call Recorder can also be used as a stand-alone room recorder. With an effective microphone activation range of easily 8 metres, the recorder can be used for discreetly recording meetings. By switching on the voice activation facility, this device can be left to record what happens in the room in which it is deployed if required. Sound quality is astounding, the twelve hour general recording and 9 hour in call battery life is extremely impressive and with a digital in-built 4GB memory giving 144 hours of recording storage capacity, the Bluetooth Call Recorder certainly does not come up short. A digital readout, play, fast forward, rewind and mode buttons make it easy to setup and control the recorder in the hand. 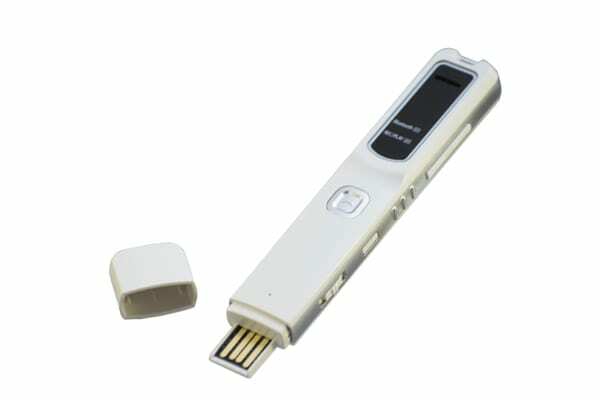 With a built in USB connector housed under a removable cover on one end of the device, recordings can easily be transferred to and played back on any Windows or Mac computer with no need for any specialist software installation. Alternatively, it is possible to listen back to recordings directly from the device using the supplied earphone or through the speaker on the Bluetooth Call Recorder itself. How do I listen back to the recordings? Play recordings through the device inbuilt speaker, supplied earphones or by connecting to a PC or Mac computer to transfer and playback. Do I need any special software to playback the files on my PC? No, the device will act like an external flash memory device, so no special software is needed, only a standard computer media player is needed. Will the person I am talking to know that I am recording the call? This device can record the call without alerting the other party in the call unlike the voice recorder function that is included in the phone’s own system which bleeps alerting the other caller know that the call is being recorded. I have a tablet phone. Can I also record my calls on this? It will certainly be possible to do this as long as the tablet has bluetooth, which in fairness should be a standard feature anyway. How far away can the mobile phone be located from the Bluetooth Call Recorder and still be able to record calls? This device may not be compatible with older phone handsets that do not have bluetooth, so it is a must to check that this facility is on the phone on which you wish to record from. Any computer used to playback recordings must have a free USB port to accept connection of the Bluetooth Call Recorder. Recordings are NOT time and date stamped in any way. An computer used to transfer to and/or playback calls must be Windows 2000, XP, Vista, Windows 7, 8, 10 and also Mac OS X.